Love the eyes. Love the nose. Love the name. Don't you want to love him? 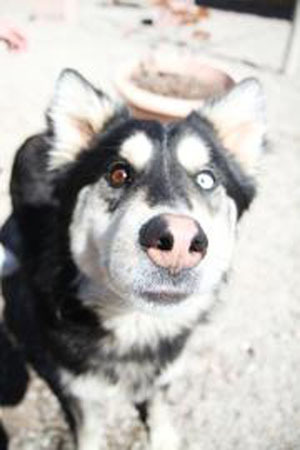 Astro is a 2-year-old Husky/Shepherd mix, who weighs 70 pounds. He’s a handsome boy with a beautiful black and white long haired coat, one chocolate brown and one very blue eye. Grooming will be necessary to keep him looking his best. He enjoys being pet and back scratches just might earn you a sloppy kiss or two! Astro came to Lollypop Farm because his previous owner could no longer afford to keep him. Astro and his adopter will need to enroll in a training class, and you will receive a discount on your first six-week class at Lollypop Farm. Children over the age of 12 are recommended, and he would do best in a cat-free household. Bring the whole family, dogs included, out to Lollypop Farm if you are interested in meeting. This special boy has been waiting too long to find his forever home, and can become a part of your family for a special adoption fee of $75.